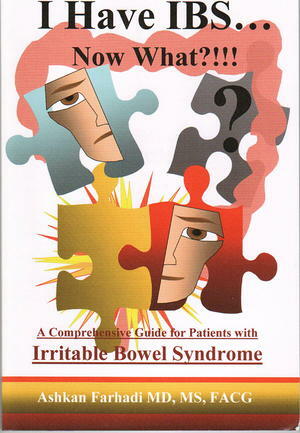 BCH independent books - I Have IBS...Now What?!!! The book, I Have IBS, Now What?!!! was written by Ashkan Farhadi, MD, MS, FACG, a leading gastro enterologist based in Chicago. Dr. Farhadi wrote this book years ago, as a resource for patients who were newly diagnosed with irritable bowel syndrome(IBS). The first edition of the book, written in 1996, sold over 10,000copies. A second edition was published shortly thereafter. The new 3rd edition features the most up-to-date information on IBS including new advances in the field. Additionally, this edition includes the opinion of additional experts. There is also a special focus on coping with IBS from a psychologist who specializes inpatients with gastrointestinal disorders. This book, I Have IBS, Now What?!!! compiles real patient questions posed to Dr. Ashkan Farhadi over his years of practice into a first rate guide for patients with irritable bowel syndrome.